QuickMove is a small program which makes it easier to move files to the folders where they need to be. If your hard drive is a little messy then that's probably because getting it organised takes quite some time. No matter how many times you find a JPEG image and move it into your preferred Pictures folder, Windows never learns that's where it should be filed, so you always have to manually relocate it yourself. QuickMove is different. Once installed, right-clicking a JPEG image will reveal a QuickMove option, and choosing this allows you to tell the program exactly what you'd like to with those files in future. So at a minimum, say, you could have them moved to your Pictures folder. And then, when you're tired of those 10 images cluttering your desktop, just right-click them, select QuickMove, and the program will automatically move them every one to the Pictures folder for you. You've more than one possible destination? No problem. QuickMove can also maintain a list of your "last used Target Folders". 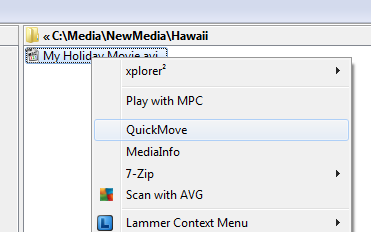 Tell the program to display this instead and when you select some files, right-click and choose QuickMove, you'll get to choose your preferred folder from a list, and the files will be moved there immediately. Of course this may still not work for you in every situation. But that doesn't matter, either. QuickMove is an addition to the usual Explorer file management options, not a replacement, so if you just want to carry out some ad-hoc moving or copying then you can do so, just as before. Please note, there's also a QuickMove Pro build which is more convenient and adds more features (it opens minimised, allows you to construct rules based on regular expressions, and so on). It's priced at $19.99, and you can order by clicking "Get QuickMove Pro" within the QuickMove Manager. Improved “Move To” functionality by adding an option to run a batch file or similar. Improved Data Storage Resilience in the event of a system crash or power failure. QuickMove provides a quick and easy way to add a little extra intelligence to your file management, and could save you quite some time.